How to fix the 3004 error in iTunes? 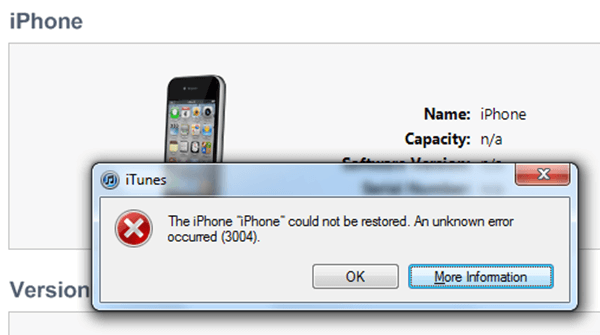 The owners of the iPhone or iPad (4 and 5 versions) are familiar with the situation when the message “3004 error” appears when upgrading or restoring the system. At the same time, it is impossible to perform further actions or even start the phone with the old software. What is the cause of the problem? What steps will be needed to cope with the situation and install itunes software? A running antivirus blocks the installation of the program, as a result, itunes cannot access the server and install the application. The firewall considers the downloaded information as a potential threat and blocks access to it. Error 3004 is issued. Important! The reason for violations during the update is not in the flaw of itunes, as it was initially believed, but in the settings of the mobile device itself. They can be eliminated by making a minimum of effort and spending only a few minutes.. The principle of operation of the antivirus is based on preventing possible infection of the mobile device. To do this, it automatically blocks any actions that pose a threat. Especially his "attract" files that contain commands to run the software. As a result of the work, the antivirus stops the download, disables the function of itunes and tries by all means to contain the potential threat of infection. The 3004 error may indicate that the protection on the mobile device is working, and the antivirus does a good job. How to handle this situation? Disable blocking programs that prevent access to the network device. Before restarting the update, open the antivirus task window and click the button to pause protection. This action may be asked to enter a password, if this option is set. Enter the code and disable the antivirus. Pops up a window with the message that the network channels will be cut off, ignore it and once again confirm our decision to stop the program by pressing the OK button. After disabling the antivirus, we launch the update in itunes again. Usually, the 3004 error no longer appears, and the software is installed without any problems. The 3004 error indicates problems when downloading and updating the file with the software. Some of the changes in the settings and the assignment of Internet Explorer as the default browser helped to resolve this issue. ITunes that conflicts with other systems responds well to this program. The only condition: the corresponding Internet Explorer settings must be made.. How to do it? We right-click on the program icon. In the drawn horse, select the browser properties tab. In response, a frame with a large number of windows pops up: "General", "Security", "Connections", etc. You will need to open the "Programs" tab. The tab will offer to make Internet Explorer the default browser. Click on the button and confirm its action if necessary. Press the start key in Windows. It is located at the bottom of the screen in the 7 software version, designed as a circle with a flag. In the window that appears, select the control panel. We are looking for the functional window of the program by default. Click on it. Click on the task key for default programs. On the left side there will be a list of all the programs that are installed on the computer. Select Internet Explorer and in the right window click on the tab that suggests using the default program. The 3004 error will be fixed in most cases. Step #3. What if the first two steps didn't help? An 3004 error may appear even after all the above actions have been completed. What could be the problem?? Pirated unlicensed software. Cheap cheese, according to one proverb is only in a mousetrap. The same rule applies to software. Moreover, if the computer through which the iPhone or iPad is updated has installed software of clearly illegal origin, we can expect that such an error will appear. Try updating the firmware from another computer, if it didn’t help to consult a specialist for help. Check your computer for viruses. Some PC owners believe that if a reliable antivirus is installed on their PC, then there is no threat to it. But it is not. If an error occurred during the update, the reason may be hidden in the presence of a trojan or other program that prevents the operation from being performed correctly. Scan your PC with antivirus, fix any problems that appear. Important! In most cases, it is possible to eliminate, through our own efforts, the reasons that prevent updating the iPhone or iPad, but sometimes, despite all efforts, specialist assistance may be required. The 3004 error does not appear on the iPhone before 4 and after the 5 version. The reason is not covered by the problems of the service and is more related to the lack of improvement of software for mobile devices. Often, you can solve the problem by disabling the antivirus and setting Internet Explorer as the default browser. Appsgames⟾Work with iTunes⟾How to fix the 3004 error in iTunes?